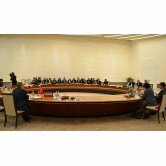 25.11.2018 | On November 22-23, Samarkand hosted the Asian Forum on Human Rights. 22.11.2018 | The Asian Forum on Human Rights kicked off at Samarkand Forums Complex on November 22. 22.11.2018 | On November 22-23, Samarkand will host Asian Forum on Human Rights. 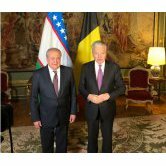 22.11.2018 | On November 21, the President of the Republic of Uzbekistan Shavkat Mirziyoyev received the United Nations Under-Secretary-General, Director-General of the UN Office at Geneva Michael Møller. 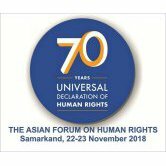 22.11.2018 | In connection with the 70th Anniversary of the adoption of the Universal Declaration of Human Rights, the Asian Forum on Human Rights will be held in Samarkand on November 22-23. 21.11.2018 | On November 22-23, Samarkand will host Asian Forum on Human Rights. 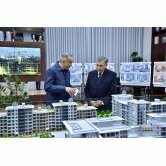 20.11.2018 | On November 20, President Shavkat Mirziyoyev became familiar with construction of Tashkent City International Business Center. 19.11.2018 | On November 19, 2018, the fifth round of Uzbekistan – Switzerland political consultations was held in Bern. 18.11.2018 | A family polyclinic and a kindergarten are organized on the first floors of apartment buildings erected in citizens’ gathering of “Kumbuz ovul” makhalla of the city of Nukus. 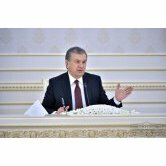 16.11.2018 | On November 16, the President of the Republic of Uzbekistan Shavkat Mirziyoyev had a telephone conversation with the President of the Kyrgyz Republic Sooronbay Jeenbekov. 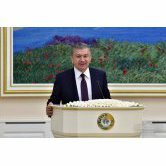 16.11.2018 | Shavkat Mirziyoyev announced this at a meeting that is being held in Nukus. 16.11.2018 | At the meeting, chaired by the President of the Republic of Uzbekistan Shavkat Mirziyoyev in the city of Nukus, issues of development of Karakalpakstan’s economy were discussed. 15.11.2018 | In the Republic of Karakalpakstan, special attention is paid to protection of public health, new medical facilities are being built and existing ones are being reconstructed. 15.11.2018 | President of Uzbekistan pays constant attention to improvement of activities of preschool education institutions – the very first and most important link in upbringing harmoniously developed personalities.